Note – this was originally written on November 9, 1971 and published in the Gateway Newspaper and on the Canadian Broadcasting Corporation’s radio network worldwide. I wrote this before I had any first hand knowledge of war. Now I have too much. Yet I am pleased with my younger more innocent friend for getting it right. Remembrance Day. It was called Armistice Day in the beginning, but times changed and the Armistice decayed. The holidaying atmosphere does more harm for the memory of the dead than not bothering to remember at all. For the majority of people, November 11 is a day off with nothing much to do. For others who have been fed through the school system, colouring God knows how many pictures of Flanders Fields and spending the Eleventh watching the cenotaph services on television out of a sense of obligation, the day is nothing except tradition. Remembrance Day does not mean feeling sorry for the dead but instead actually trying to understand the horrors of war. To spend the day feeling sorry for the dead puts a premium on dying for the glory of a political system that ceased to mean anything years ago. We have become so full of the idea that to die for your country in a war is the highest form of honour that we become almost eager for another so we too can make the “noblest sacrifice”. 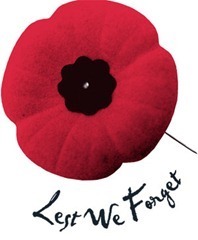 Remembrance day originated as a vehicle for showing people the horrors, futility, and wastefulness of war in any form. Men do not on a whole want to die. So why did they die? The answer is that they were forced to die against their will. They were caught up in a machine that was a product of their times, A machine built of political ideology, national pride, flag waving, and rampant nationalism. They went, for the most part, willingly to war because they did not know any better. They did not know the horrors of the battlefield and as a result they were dead before they knew it. They died in the mud of France, the sands of Africa, the seven seas, and in the skies. Their deaths were not pretty. Few of them were able to die with the noble dignity portrayed by Hollywood. Even fewer of the civilian victims died with dignity. How for example can a child of two feel the romance in glorious combat when his city is firebombed and a shower of phosphorous eats into his body? How can a man feel the honour of saving democracy from the foe when he is trapped in the hull of a ship sinking into the depths of the ocean? How can the residents of an insignificant German village feel proud of their fight against the enemy when a pitched battle between two armies reduce the place to rubble? How can you feel proud of our glorious dead when you know the permanent harm they and the survivors did to our civilisation? When the last post sounds on Remembrance Day you could do worse than refuse to honour the fallen. The only people who should honour the dead are the living who came through the wars with the knowledge of what it was really like. For those of us who have not had the experience of being part of a world destroying machine the day should be spent in trying to learn what really went on during the wars. We should be forced to watch films of men dying, cities burning, and the terrible destruction of war so we will not be so eager to join when some power mad leader sounds the call to arms. Most of us have seen film footage of Hiroshima and Nagasaki when the American Air Force dropped the Atomic bombs. We saw the bomb itself go off with its awesome power and we saw what it did to the cities. We saw the survivors and the ugly burns they had. We saw the dead and the dying, the blinded and we saw what was left of their homes. 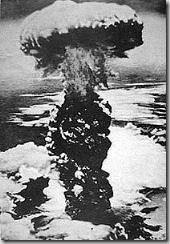 What we might not realize though is that Hiroshima and Nagasaki were not alone in that type of horror. Dresden was firebombed by the allied air forces and totally destroyed. There were no vital Nazi war industries in the city. Dresden was killed as a symbol to the German people what would happen to them all if the Nazis didn’t surrender. If only a small part of each child’s education was devote to the horrors of warfare instead of memorizing “In Flanders Fields” it would put a greater depth of meaning into Remembrance Day. Perhaps if more of us had the opportunity to talk to the ageing warriors in the Legion we would get a better perspective of what the wars were like. When you sit across the table from some old man and buy him a beer and get him talking you hear about the great times he had in France during the first war. You hear about the time they had a twelve hour leave from the trenches on the Marne and they went to Amiens to get drunk but the town was dry so they spent the day looking for women but there were none. 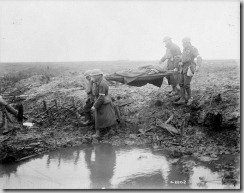 You might near how it rained for three weeks and the trenches filled with water and they slept in the mud and had a great time playing cards. After a while, when he has had his third beer and the memories come back you can drag out of him things he has forgotten for forty years. The stench of the trench that he learned to ignore after a few months. The time his best friend was killed five yards out from the wire and it took him six hours to die and they could not drag him back to safety because the bullets were too thick. The time he was trapped under a crossfire in a shell hole for a day and he had to share it with the week old corpses of a mule and a German. Even then you have the feeling that things were worse; they don’t say it but you get the feeling that the constant terror of death and the hopelessness became a constant companion. They don’t tell you about the times they broke under the strain, of the times they hid in a shell hole instead of facing the enemy because the horror became too much. They don’t tell you of what it was like to have your youth wasted and warped through years of war. Nor can you ever fined out what six years of death and killing did to their minds. It is clear there is not an Armistice among the world powers these days but a state of subdued, judicial killing under the guise of what is called “bush wars”. Suez, Cyprus, Vietnam, Cambodia, Cuba, Hungary – the list is long and will get far longer before people kill themselves off, or mature enough to realize that war is no solution to their problems. November 11 is a time to remember that war is wrong and never worth the cost. Time to remember the dead, only for what they are, not what the histories and the speeches say they were. They are nothing more or less than dead. Time to remember that you would not want to die and that it is possible to do something about future wars. Time to remember and feel sorry for the people that are living, who will live in years to come, and who are going to die violently because of a war..